Wow, Day Eleven of 30 Paintings in 30 Days and I am still going! Today's painting was intimidating at first, but once I got started it was a lot of fun. I love painting reflections and all the glass marbles were lots of little reflective surfaces. I enjoyed looking for the reflections in each of the marbles and painting the variety of colors. I started by masking all the shiny spots and then just picked a marble and moved around painting the colors I saw. Once the back marbles were done and dry, I used a scrubber brush to soften the edges so that they would look blurry. The M&M's were were a nice contrast to the marbles with solid, bright colors. 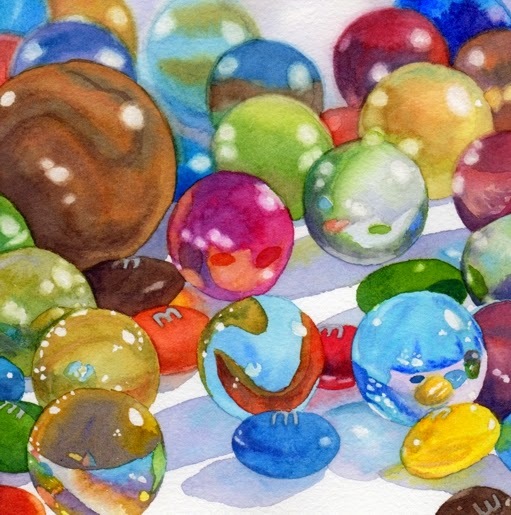 "M&M's and Marbles" is a 6"x6" watercolor and is available for purchase from Daily Paintworks for $90 SOLD. Lovely work, Lorraine! Love everything about it! Thanks a lot Tam. I think I have found a subject that I would like to paint more often.